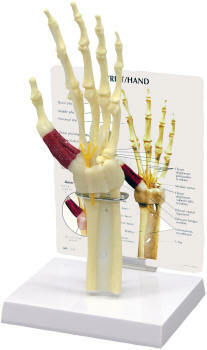 This full-size model shows the bones, muscles and tendons of the human index finger. Stand included. 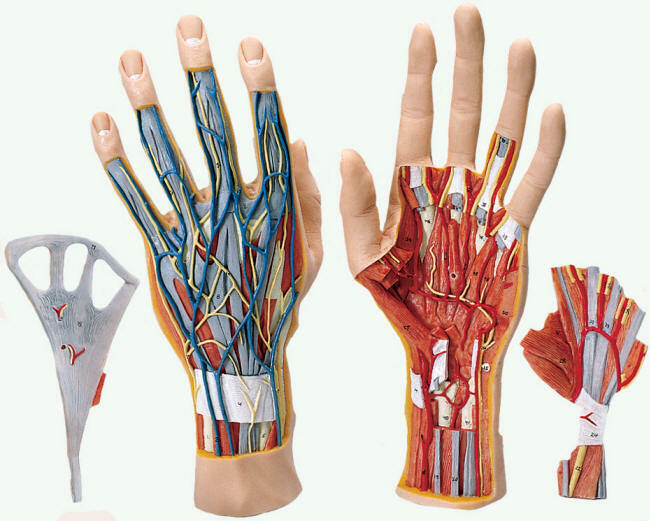 Full-size hand model shows the superficial and internal structures of the hand, including bones, muscles, tendons, ligaments, nerves and arteries (superficial and deep palmar arches). The palmar aponeurosis and plate of the superficial tendons are removable. This 3-part life-size hand skeleton model shows the anatomical detail of the ligaments and tendons found in the hand, wrist, and lower forearm. The interosseous membrane between the radius and ulna is shown along with the bones of the hand. The flexor retunaculum is removable from the hand skeleton. In addition there is a removable portion that can be fitted on the back of the hand model. This portion features the clinically important structures of the carpal tunnel such as the flexor retinaculum, mediane nerve, and tendons of the hand. This high quality hand model anatomically correct is great for detailed study. Comes with base. 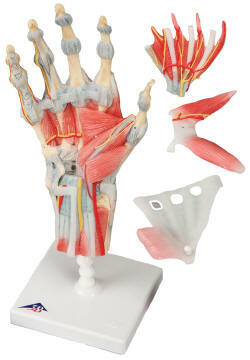 The bones, muscles, tendons, ligaments, nerves, arteries, and veins are all featured in this high quality 4 part model of the hand and lower forearm. The dorsal side of the hand shows the extensor muscles as well as portions of the tendons at the wrist as they pass under the extensor retunaculum. 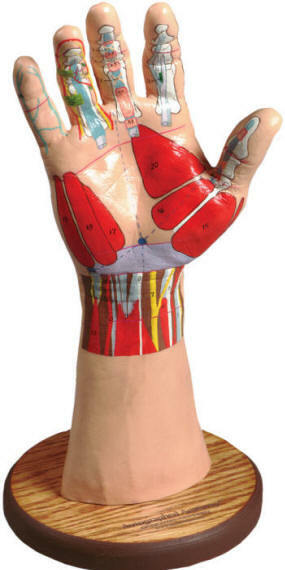 The palmar face of the hand is represented in three layers, the first two are removable to allow detailed study of the deeper anatomical layer of the hand. In addition clinically important structures such as the median nerve and superficial palmar arterial arch can be explored in detail in the hand model. The deepest anatomical layer allows for study of the intrinsic muscles and deep palmar arterial arch in addition to other details of the anatomy of the hand. This high quality anatomically correct hand model is life size and comes with base. Carpal tunnel syndrome (CTS), or median neuropathy at the wrist, is a medical condition in which the median nerve is compressed at the wrist, leading to numbness and muscle weakness in the hand. The diagnosis of CTS is often misapplied to patients who have activity-related arm pain. 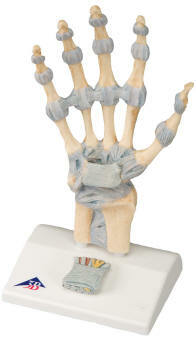 This model consists of a hand skeleton showing appropriate muscles and nerves. A patient information card explains everything. 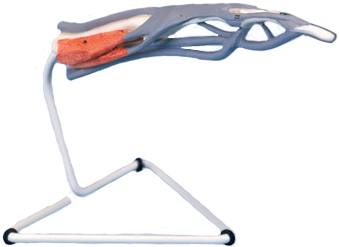 This colorful visually-oriented desktop model illustrates key features of structural anatomy that are essential to understanding and treating hand injuries.